I’m looking for the perfect striped shirt. It’s a must-have piece for any wardrobe. I’d throw it on with a pair of dark jeans, my Rachel Comey gunmetal gray stacked heel boots, a simple necklace and some fun dangly earrings. Don’t forget to put in your daily vote at the Poppies. love the one from jcrew. i took this photo (http://www.flickr.com/photos/amysahba/4298454350/) mainly because i just adored her striped top. great photo!!! 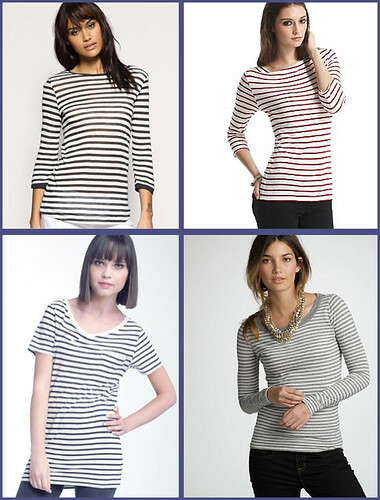 It’s true, a striped top is so simple, elegant and just makes anyone look good and pulled together! Like a little French Gamine. I really like the one from Asos! I love striped shirts and always have them whether they’re “in” or out. This season I have Velvet’s trapeze cut striped shirt–super cute, I highly recommend! ohhhhh I’ll check it out. i love that brand! Oh, this reminds me on mine. Should look for it in my closet. Mine is grey white.